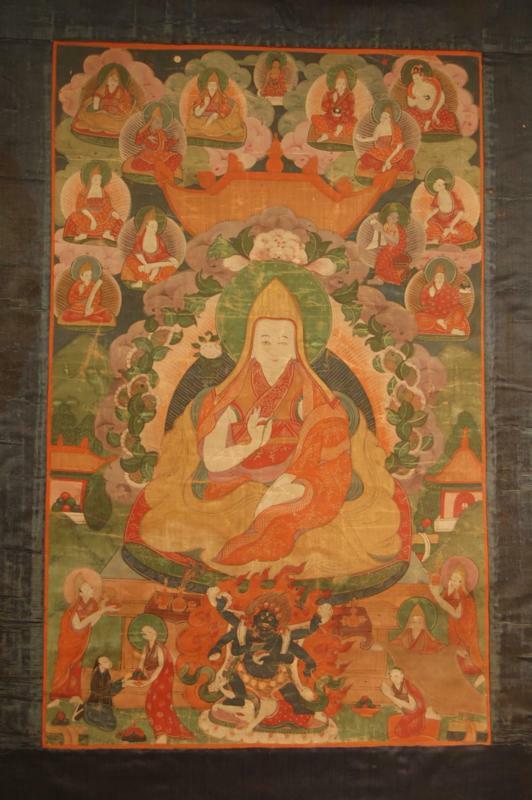 This is a hand-painted Sino-Tibetan Thangka of Deified 14th Century Buddhist Philosopher Je Tsonghapa. This intimate painting, with an exquisitely subdued and harmonic color palette, is hand-painted on a soft, flexible cotton canvas and silk fabric backing in accordance with the cannon of 19th century Thangka painting, a Buddhist form of devotional iconography. Although it appears decorative, the painting's intended purpose would have been to serve as a light and easily transportable meditation device for the owner. The painting's flexibility allowed its' original user to reflect upon the depicted archetypes at any time, and in so doing, delve into a pool of deeper psychological awareness. The central figure of the painting is deified 14th century Buddhist philosopher Je Tsonghapa, who was an admired leader and became canonized in writing and in visual form as shown in the painting, seated in a meditative pose, wearing a gold hood, with a green halo surrounding his head, and lotus blossoms surrounding the green halo. Who was Je Tsong hapa, and why was he beloved in his lifetime and canonized in his death? He was the leader of a subculture within Buddhism known as Kadampa, and he taught principles of moral discipline, compassion, and wisdom. He was also the founder of the Ganden Monastery, one of the -great three- university monasteries in Tibet, which was tragically destroyed in a rebellion in 1959 and has since been partially rebuilt. Interestingly, the compositional structure of the painting's cannon places Je Tsonghapa, the sainted, meditative figure, upon the shoulders of a powerful, deep-blue, multi-armed, guardian figure who is engulfed in blinding orange fire, yet not devoured by the flames. He is likely Vajrapani, the Buddhist deity who represents power, fierceness, and wrath, channeled in service of noble ends. This compositional structure conveys the tantric idea that harmony and wisdom rest upon a solid foundation of fierce, wrathful, awareness and discipline. Ex Founder of The Philosophical Research Society Museum; Manly P. Hall.